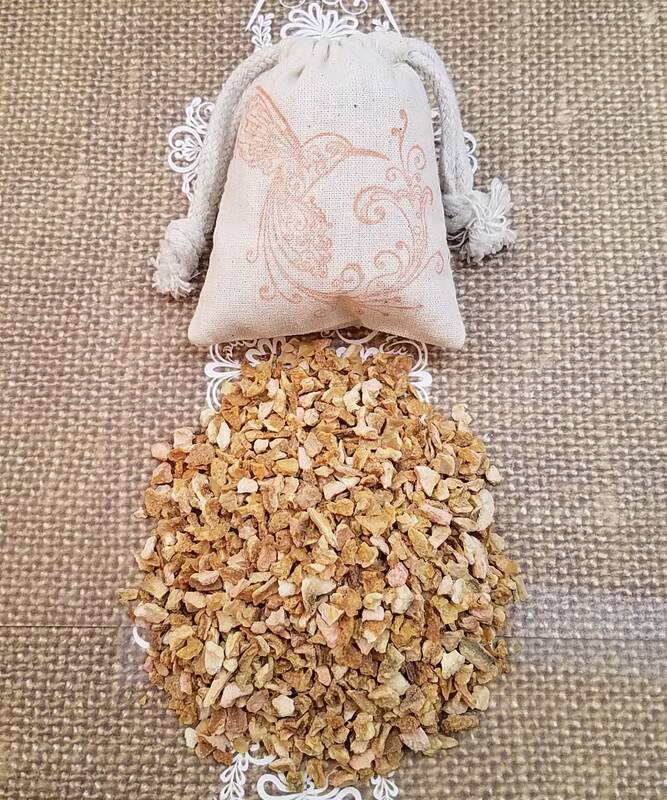 Organic Herb Sachets in Muslin Bags: This listing is for sachets filled with dried organic lemon peels and a stamped orange hummingbird print on the front. 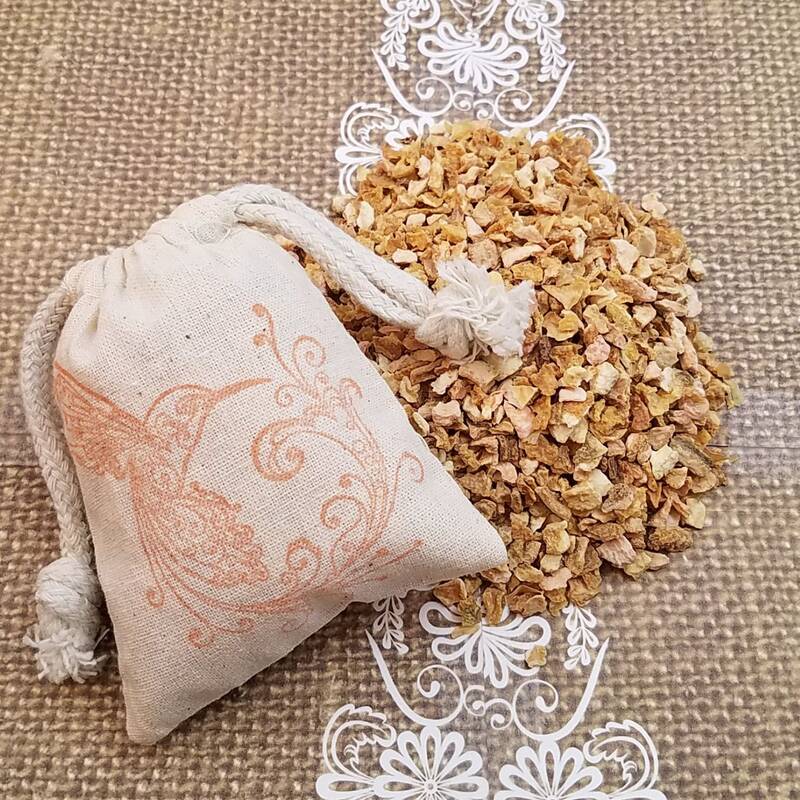 Our sturdy 3”x4”cotton muslin bags are hand-filled with a generous 1/3 cup of organic herbs and dried fruits. 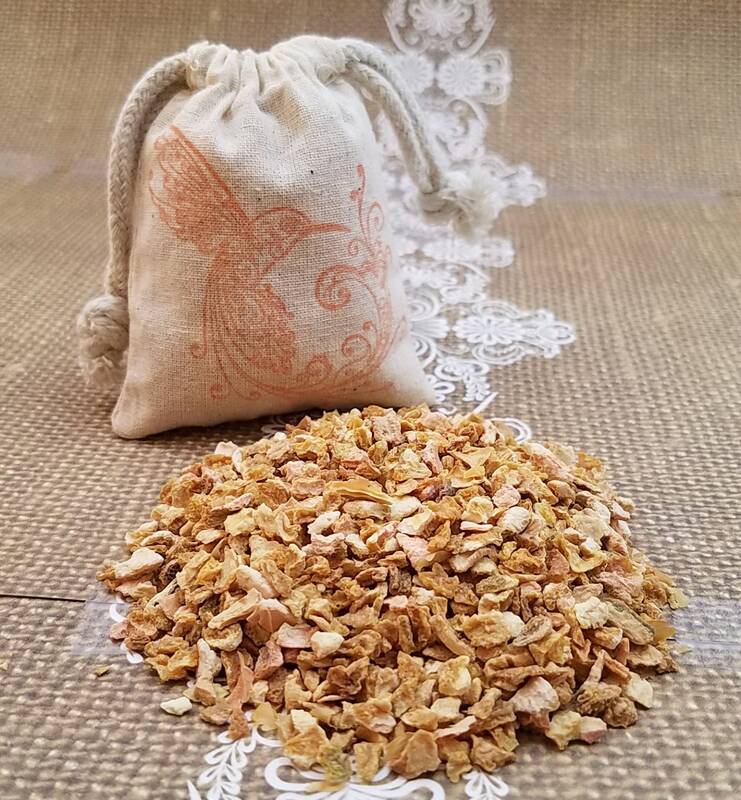 These sachets will be incredibly aromatic for a long, long time -- to scent your drawers and closets, to repel moths, use in your own home crafts or in your laundry. 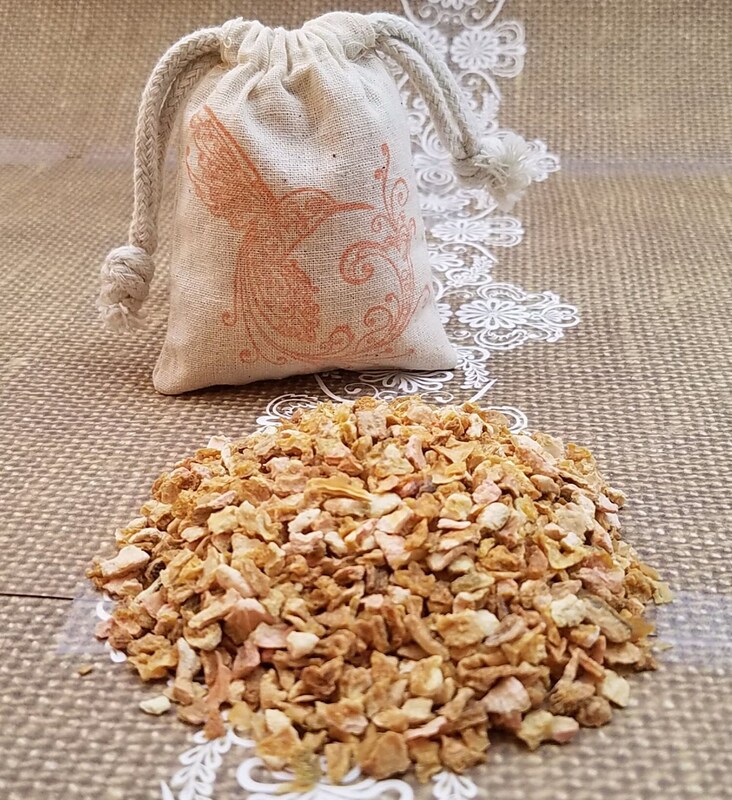 No synthetic fertilizers or chemicals are used throughout the herbs and dried fruits lifetime. We accept Direct Checkout as well as PayPal as payment options, orders are securely processed using these methods; we do not have access to your credit card and/or bank account details. Prices may change at any time without notice. Please note we are not responsible for forgotten coupon codes after the order has been submitted. Contact us before submitting your order if you find any complication with a coupon code. All residents in the State of California will be charged with applicable sales tax. We ship via USPS within 1-5 days of placement of order. Most of the packages go regular First Class and Priority Mail. If shipping overages exceed the frequent shipping methods per package over $2.00, money will be refunded (after material and other additional costs). We ship orders from Monday to Friday, excluding holidays. Please note that domestic shipping could take from 1 to 9 business days to arrive to its destination. If a package is not delivered due to an incorrect address and package is sent back to us in good condition, we will issue a refund of the cost of goods. Shipping cost is non-refundable. Purchaser is responsible for all costs resulting to re-ship the package. We are not responsible for lost or damaged packages. Please understand that once your package is shipped, we don't have control of how long it takes to arrive to its destination. In excessive heat please allow soaps to sit at room temperature for a few hours or place them in the refrigerator before opening. We want you to love the product you buy. But, if for any reason you are not happy, please contact us as soon as possible. Due to the nature of the product, we cannot accept exchanges, but we can work out something to address your concern. To cancel your order, please contact us. We cannot cancel shipped orders. We won't make any changes to your order after one hour of submitting it. Shipping cost is non-refundable if a package is not delivered for any reason and package is sent back to us. Purchaser is responsible for all costs resulting to re-ship the package. We are not responsible for lost or damaged packages. Once a package leaves our possession we are no longer responsible in how the package is treated. We will not refund for damages caused due to shipping. If shipping overages exceed the frequent shipping methods mentioned above per package over $2.00, money will be refunded (after material and other additional costs). Please keep in mind that due to the handcrafted nature of our products, individual products differ slightly. PLEASE READ THROUGH THE INGREDIENTS VERY CAREFULLY TO MAKE SURE YOU ARE NOT PURCHASING SOMETHING YOU MAY BE ALLERGIC TO. My soaps are composed of 100% all natural and vegan friendly ingredients which are completely biodegradable and safe for all skin types. All ingredients are hypoallergenic and vegetable-based, and do not include parabens or SLS. Any fragrance oils used to enhance any of my soaps are skin safe and phthalate-free, and all colorants used are FDA certified safe for cosmetic, bath and skincare use. Of course as with all skincare products, discontinue use if you experience any irritation. My all natural ingredient soaps do not contain chemicals that keep them from sweating, so it is completely normal for soap to sweat or produce “soap crystals.” Sweating depends on the level of moisture (humidity) in the air where you live. Your soap comes sealed to protect it from the elements so that you can keep it on display until you’re ready to use it, though soap crystals can form on the bar within the packaging as the temperature outside fluctuates. The sweat you may experience where you live is natural for all natural soap and does not affect the quality or usability in any way; it is completely normal and safe! You can help reduce sweating by keeping your soap wrapped until use, and then keeping it as dry as possible when it’s not in use.